Wearing the same hairstyles day in and day out can definitely get boring but it can be difficult to come up with a fabulous hairstyle that you don’t need a hair salon for but you still come out looking trendy and gorgeous. Here’show to do a few of the most fabulous hairstyles on the planet to help guide you and spice up your look. Part your hair in two sections. Secure the one side so that they don’t get mixed up. Do an inside out French braid with the one strand and work your way up, keeping the braid tight and against your crown. Secure with elastic. With the opposite side your start at the top of your head and complete an inside-out French braid as before. Secure with a elastic. Secure both sides with bobby pins. This braided crown is beautiful and trendy. A polished top knot bun is a fabulous hairstyle that can go from the office to the nightclub. It looks chic and elegant, but also high fashion and confidant. Pull your hair back into a slick high ponytail. Divide the hair into two sections. Starting at the base of the ponytail, wind each part around each other, moving in a circulation motion, around the base. Make sure you keep the pieces moving in the same direction and tightly bound to keep them sleek. Wrap the bun around the ponytail base. Secure with bobby pins and hairspray. Tip: If you want a messier bun then tease your hair before creating the bun. The perfect top knot bun is fun, fashionable, and chic. These trendy long-waves are a timeless, classic look that makes a statement regardless where you wear them. They are great on any length and texture of hair and with any face shape. They make some time to learn how to do them quickly, easily, and so they look good but once you do they can be done in as little as 15-30 minutes, depending on length and hair texture. There are also a lot of different varieties in vintage waves, mostly differentiating in their tightness and here’s how to do a wavy vintage hairstyle for long hair. Begin with straight smooth hair and divide your hair into 3-5 sections horizontally. Begin curling from the bottom with a 1.25-1.5 inch barrel curling iron. Hold your hair vertically when curling and be sure you have all your hair in the curling iron. For your top curls you will use a different curling approach. You will take sections about 2-3 inches wide, place the curling iron at the top of your head parallel to your hairs part and clamp down. Move down slightly from the bend you just created in your hair and clamp down. This will create an S pattern curl. Repeat until finished. Run your fingers through your hair to loosen and soften the waves. Part as desired and secure with hairspray. Vintage waves look beautiful on all women. Michael Kors introduced this hairstyle in his Spring/Summer fashion show and it quickly caught the eye of everybody. It is the perfect look for women who want to spruce up their hairstyle but don’t have a lot of time. The double knot ponytail hairstyle looks particularly chic with wavy hair. Tie hair in a knot. Tie hair in in a second knot. Adding volume and texture to your hair will give this simple hairstyle additional stylish flare. 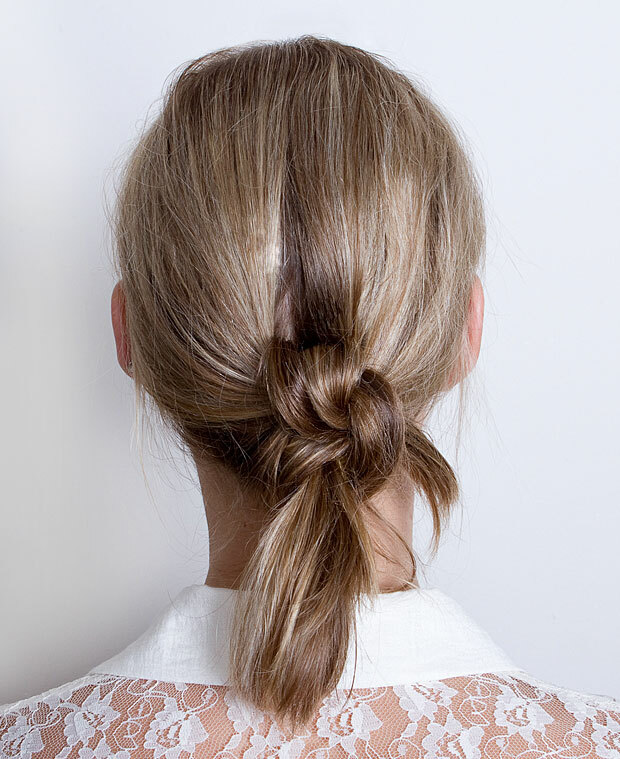 This double knotted ponytail is simple and spruces up an old classic hairstyle.